Monday, March 17, 2014: Up to partly cloudy skies with temperatures in the mid 70’s. As we prepare to depart from Fiddlers Cove RV Park on California’s Silver Strand we realize that we have gone about as far west as we can without getting wet…..so today officially starts our return trip home. Notice anything different about our Logo in the header? On the road at 1100 and picked our way through various back roads until we intersected I-8 near El Cajon and then headed east. Sad that we are leaving sunny California but happy we are heading back to sunny Arizona to spend more time with family and just as important to participate in the social event of the year! As we climbed into the Laguna Mountains, we bid farewell to San Diego for another year. Crawling over the 4,200 foot summit of the Tecate Divide we both received alerts on our iPhones that read: “Welcome to Mexico”. 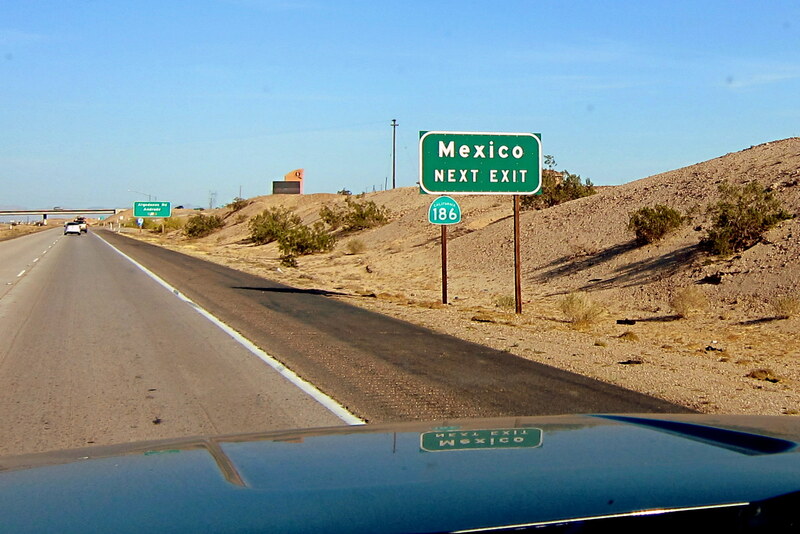 This has occurred a number of times on past trips while near the border. It’s always a bit disconcerting in that our phones do not have a Mexican call plan but it gets kinda humorous since Kit wakes up abruptly and accuses me of taking a wrong turn somewhere and thinks we really are south of the border! 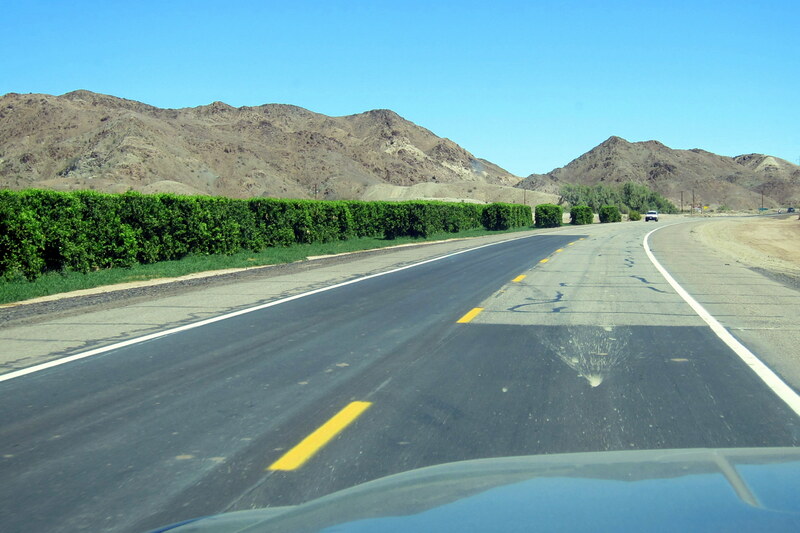 Dropping off the backside of the Laguna Mountains we are in the Imperial Valley and once again near sea level. 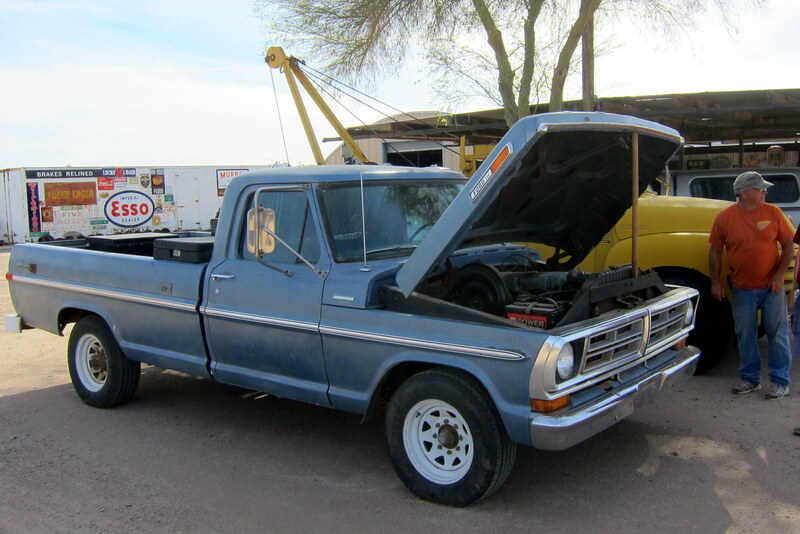 We decided to pull off the interstate at El Centro for fuel and groceries and stepping out of the air conditioned truck we both gasped. Yikes it’s hot! Dry heat or not, it’s damn hot! Making short work of our errands we were back on the road by mid-afternoon and continued east on I-8 paralleling the Mexican border. 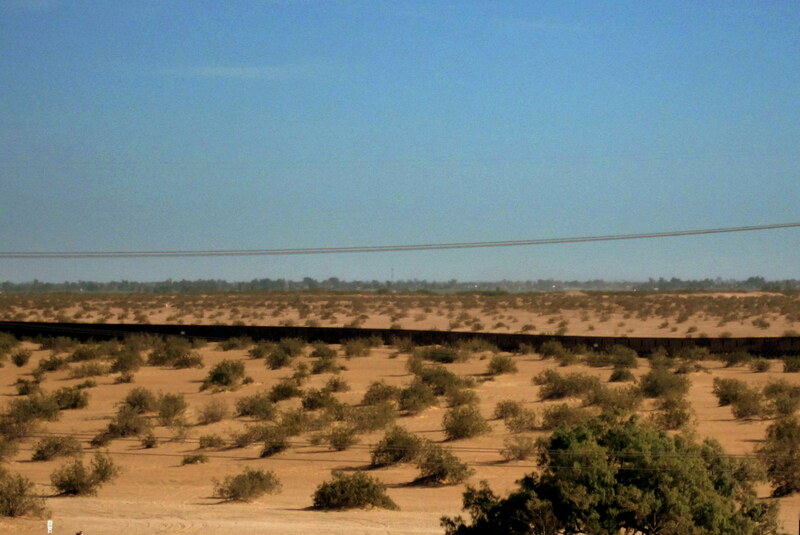 There are portions of the interstate that we get glimpses of the actual border and the infamous 2.4 Billion, 630 mile fence that frankly keeps very few folks from illegally walking into the US. Don’t have any better solution than the government. I just like to complain about tax dollars spent unwisely….complaining about the government is what I do; I’m retired for God sakes! 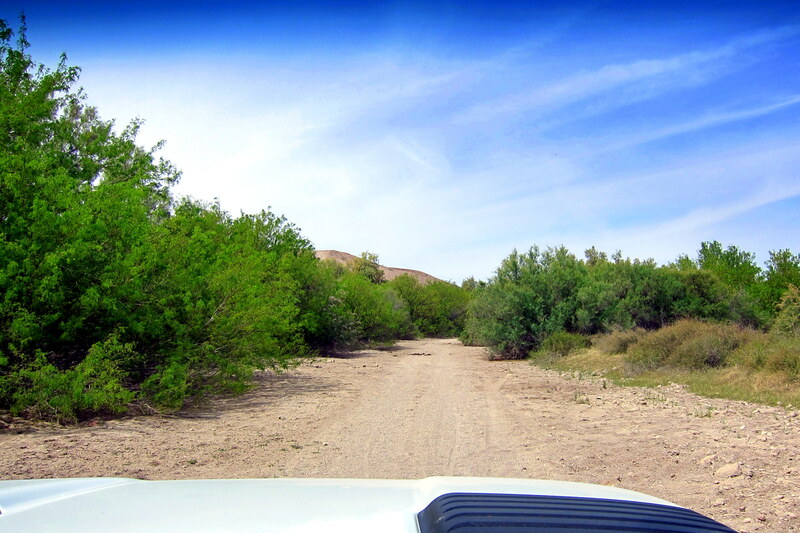 A few miles further on we passed by The Imperial Dunes Off Road Vehicle Recreation Area. Being a Monday, there weren’t many folks blasting about on their ATV’s or sand rails. 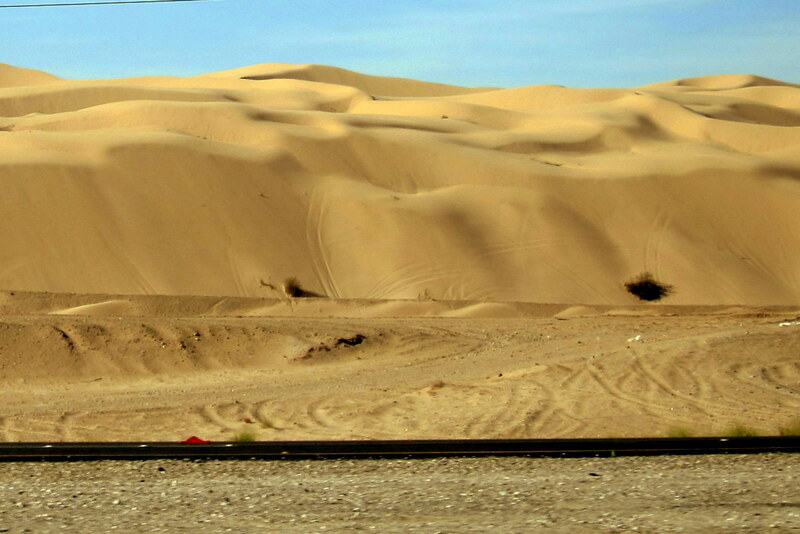 As a testament to how Mother Nature erases some man made scars by Sunday afternoon those sand dunes will be covered with vehicle tracks, but by the next morning the relentless desert winds will obscure almost all of them! Crossed into Arizona at 1638 and then pulled into the town of Yuma, a snow birders paradise due to its reputation of featuring the most pleasant winter weather in the nation. 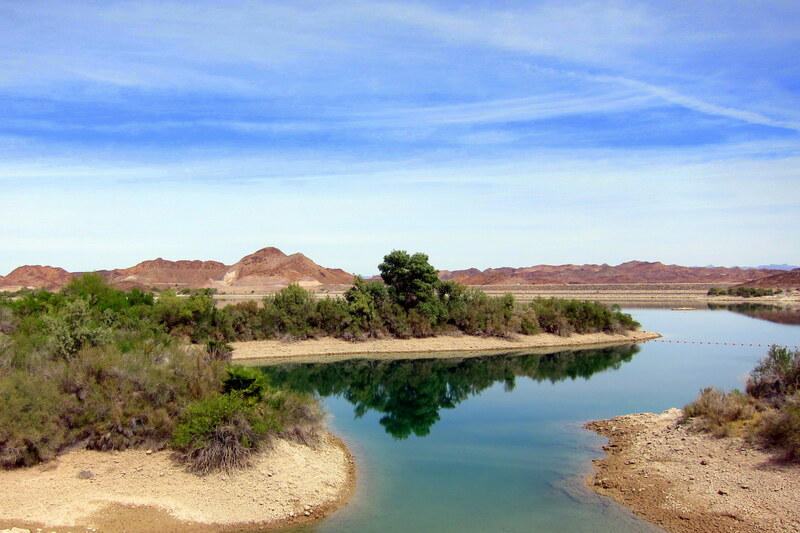 Yuma, Arizona receives an annual rainfall of just over 3 inches which makes it the 9th driest place in the United States. In addition, the sunshine percentage exceeds 90% making it statistically one of the sunniest places on earth! However six months of the year the average temperature exceeds 90 degrees, and can stay above 100 degrees for weeks at a time…..the extreme heat will flush out most sane snowbirds and send them back to their homes in the north. We decided to stop in Yuma because a few friends from back home have become Winter Arizonians and we were looking forward to visiting with them. 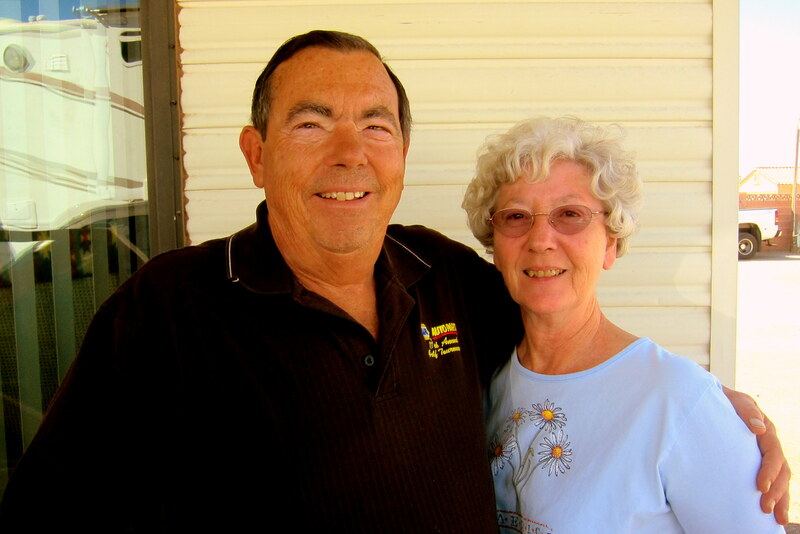 John and Gloria are from Windham, Maine, and a few years back purchased a nice unit in a quaint RV Park on the edge of town. And, they were kind enough to secure a spot for Kit and I right around the corner from their place at Garden Oasis RV Park. To welcome us to town, John and Gloria invited us to dinner. Arriving at their nicely appointed park model trailer we enjoyed delicious Chicken Tortellini Soup and red wine! As the wine flowed, so did the conversations…..Kit and I had a great time! 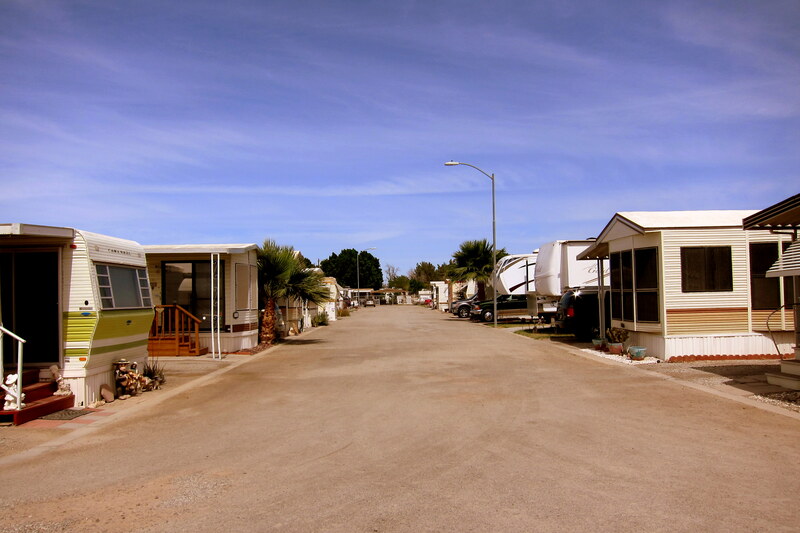 Garden Oasis RV Park is a neat little facility located smack-dab on the California/Arizona border. 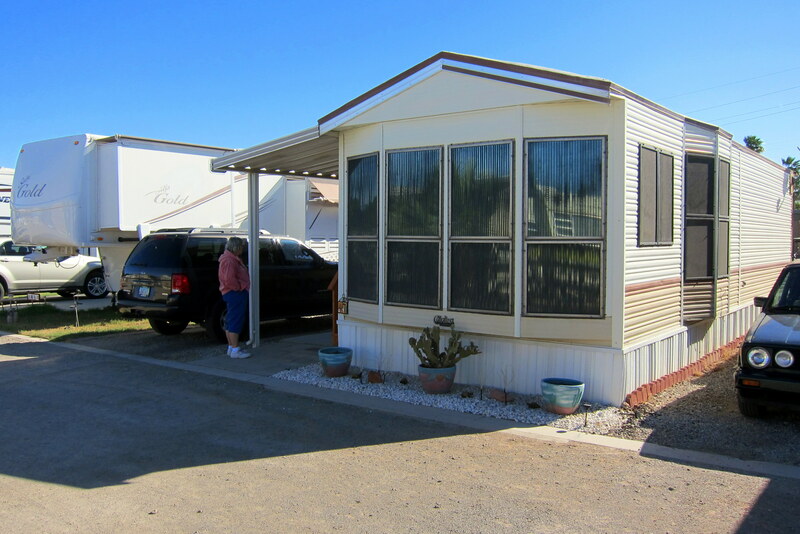 Many of the homes are park model trailers with a scattering of fifth wheel and travel travelers in the mix. John and Gloria have one of each! The park model trailer is their winter home, and the fifth wheel trailer to its left is the unit they travel in…..nice combination for folks that want to beat the winter snow but still want to RV about the country! 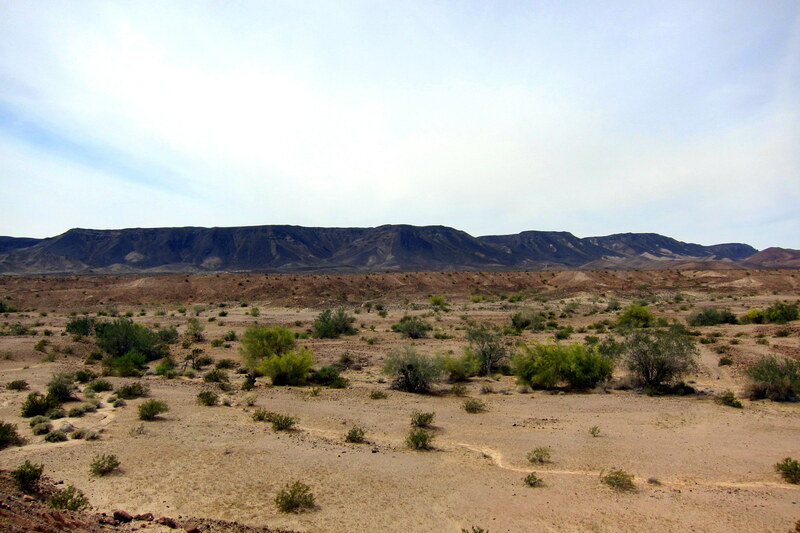 Many of the sites are artfully decorated and landscaped with desert plants. 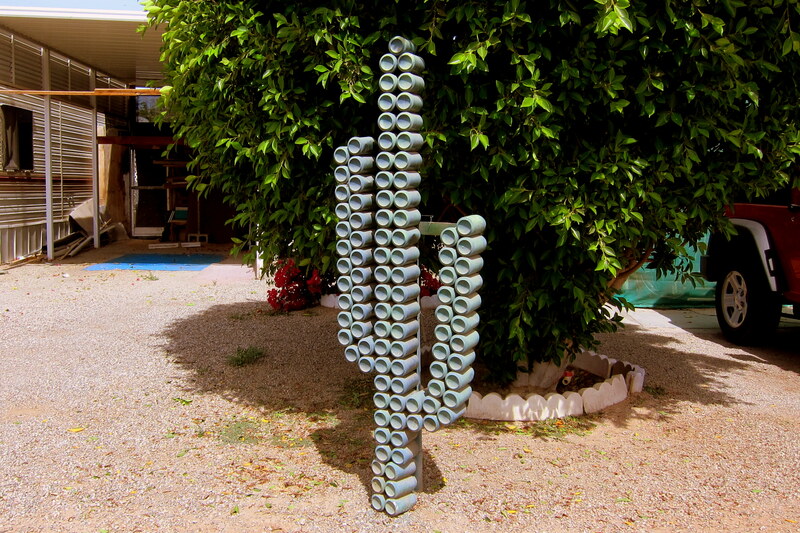 And there was some creative “yard art” in the park as well…..such as the desert themed sculpture seen below. 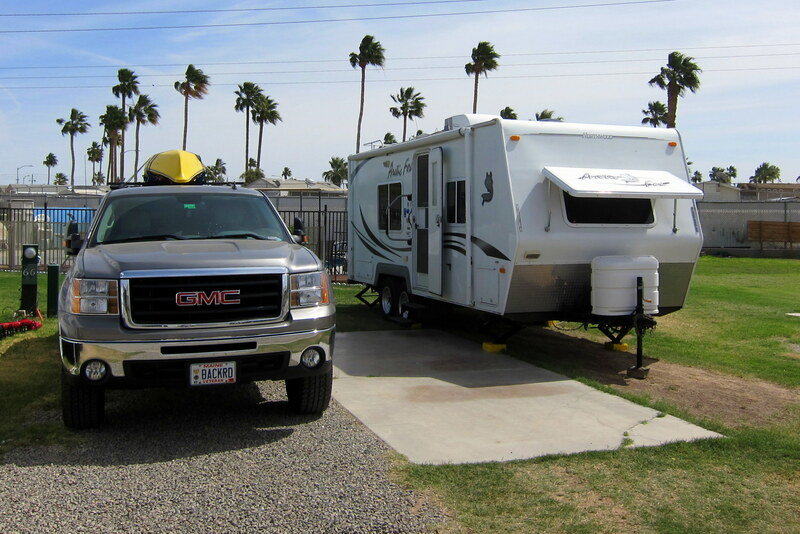 Tuesday, March 18, 2014-Garden Oasis RV Park, Yuma, AZ: Up to blue skies and warm temperatures. While doing my daily check of weather.com I discovered the following: Temperature-91 degrees, Humidity-9%, Winds-15 MPH from the west, and Wind Chill-87 degrees…..seems odd they took the time to calculate the wind chill?!?! 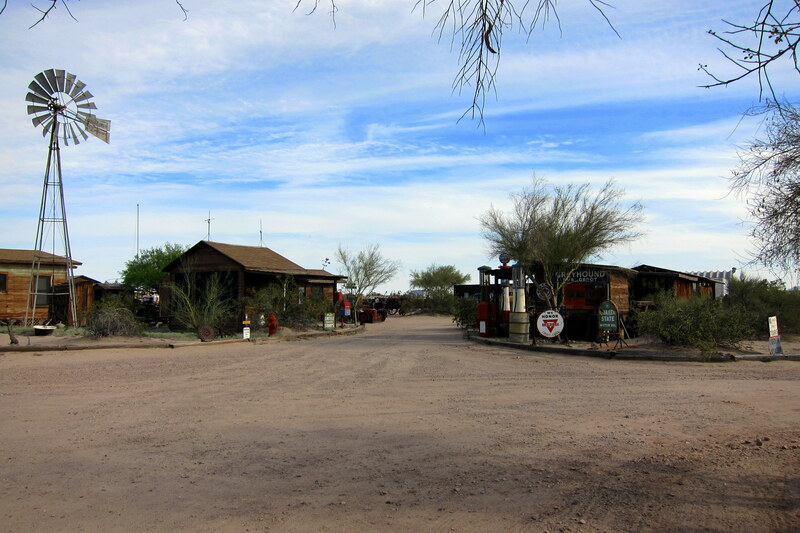 Today, John and Gloria offered to take us to a local institution, Dobson’s Ranch and Museum over in Tacna, Arizona. 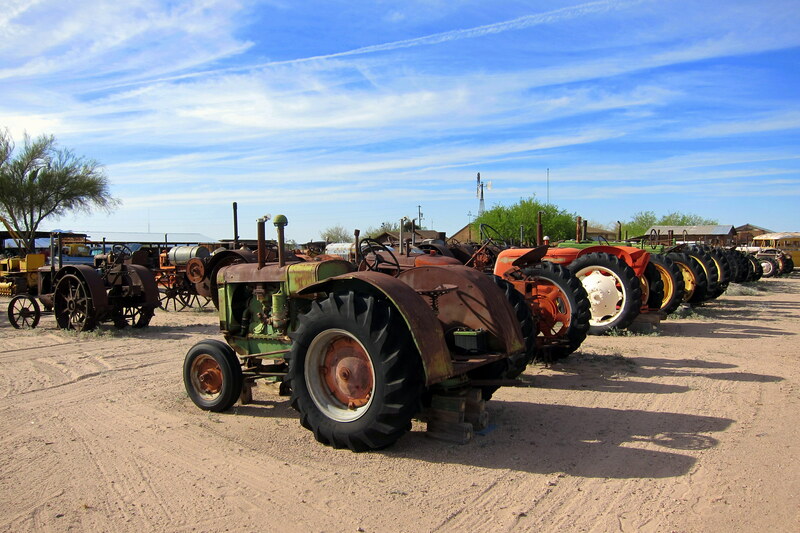 Arriving at the ranch, we learned that Ace and Windy Dobson were the original pickers! 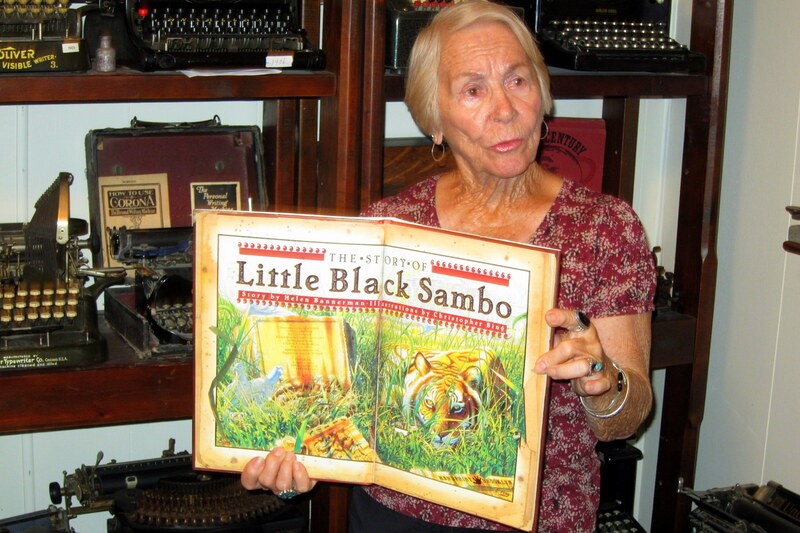 Over fifty years ago they started collecting anything and everything that interested them. 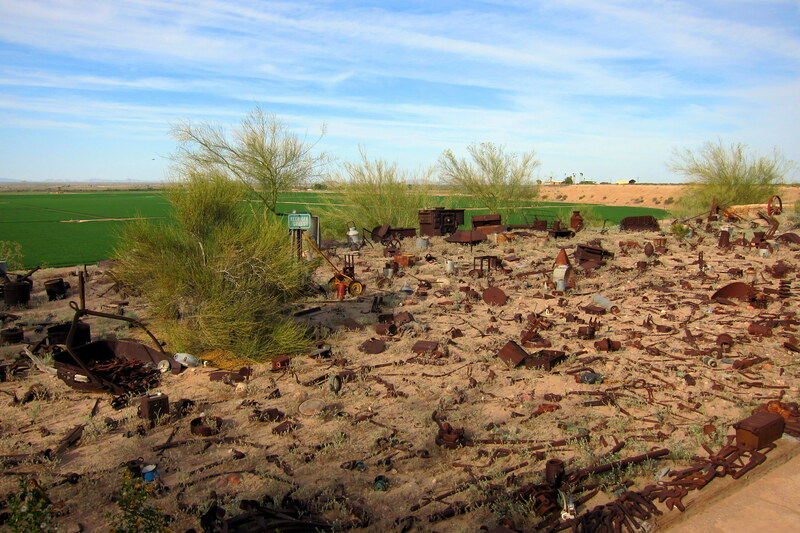 And many of these artifacts were “picked” from old abandoned homesteads or dumps. An interesting side note, the museum is actually Windy’s home. After tours are over for the day, this is where she eats and sleeps! 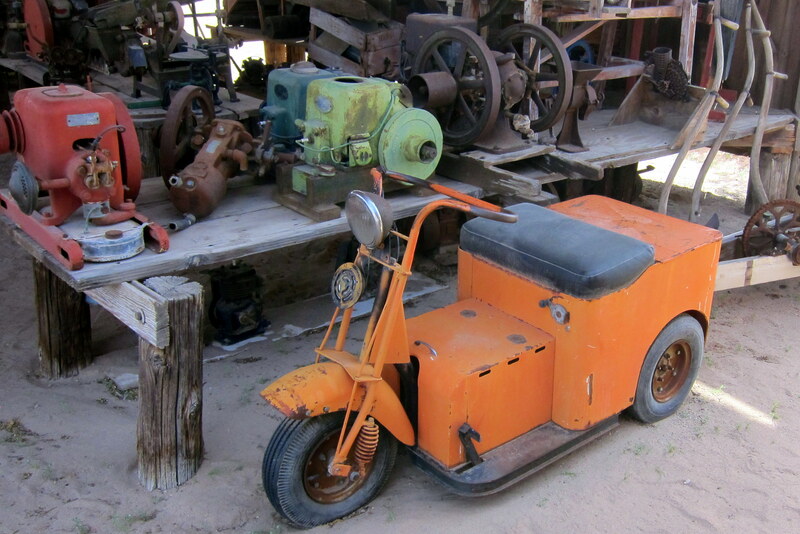 Ace passed on a few years ago, but Windy and her family still care for these unique and historic pieces of Americana. 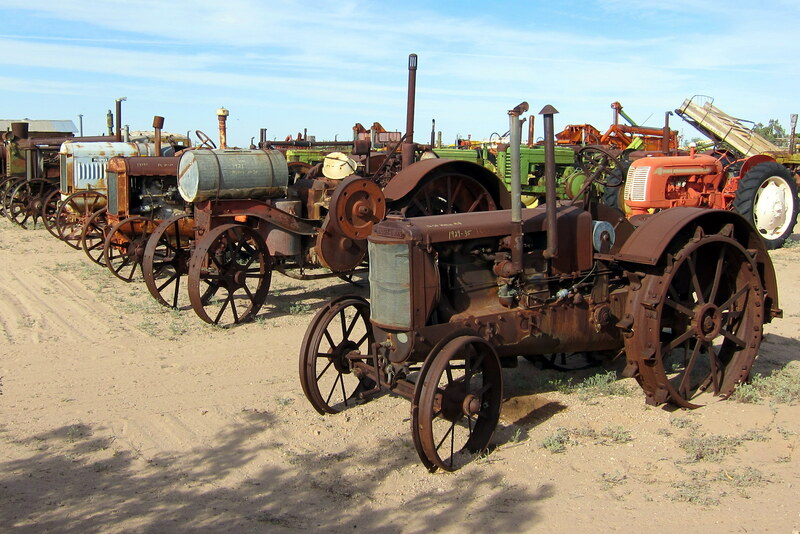 Their vast collection consists of old tools. 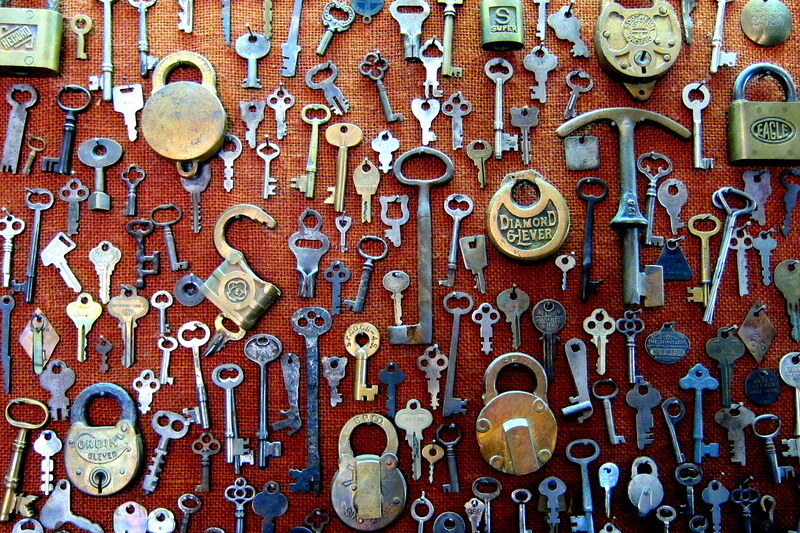 There are old locks and keys. And, various pieces of old office equipment. And a nice collection of books no longer in print. 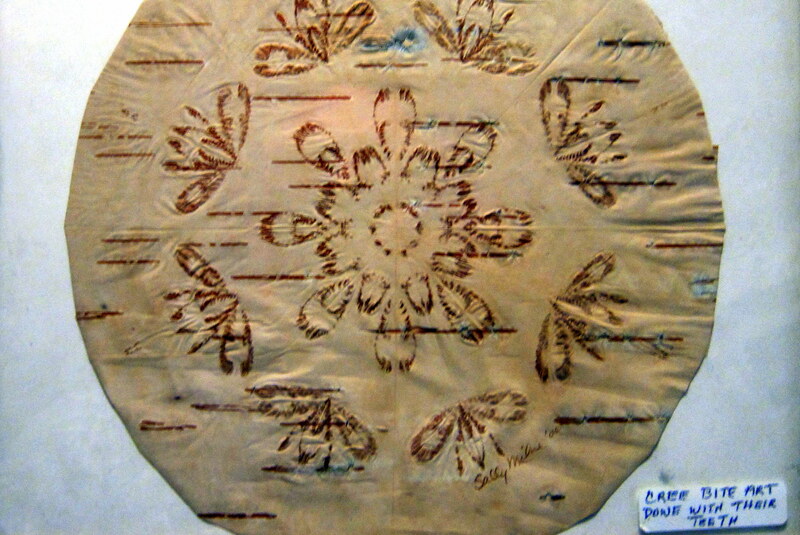 As well as some unusual Indian art. 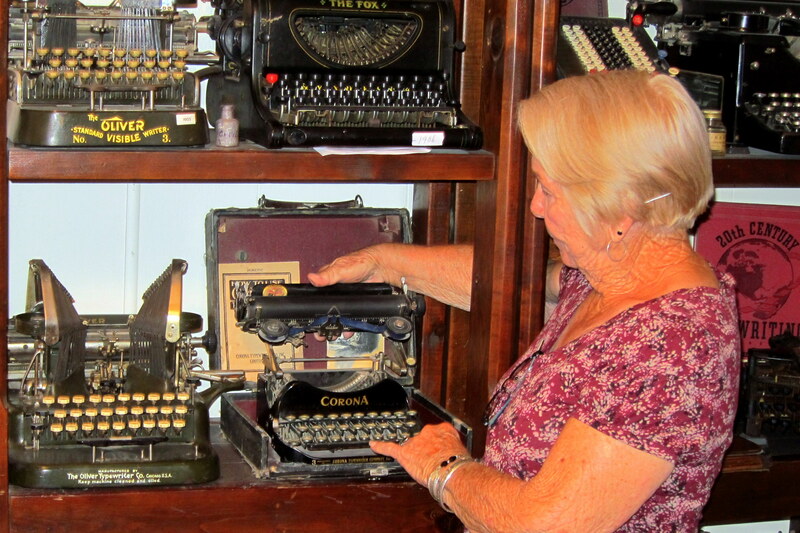 There are many examples of early consumer products. 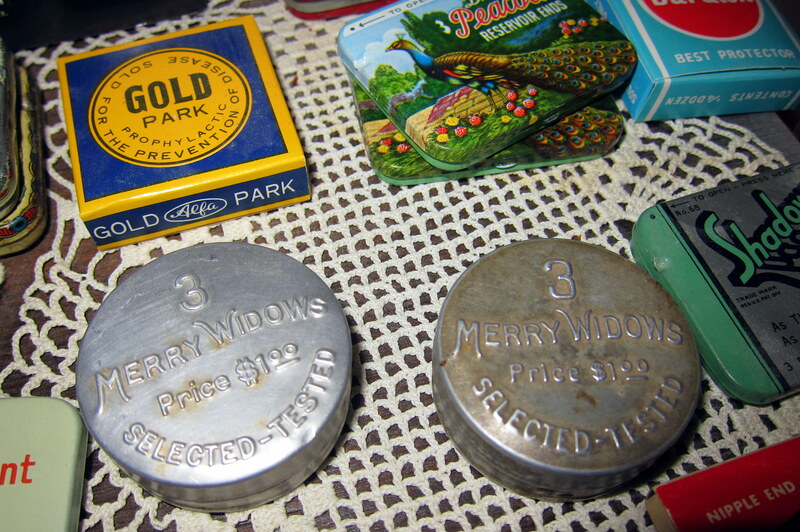 As well as examples of early can goods. 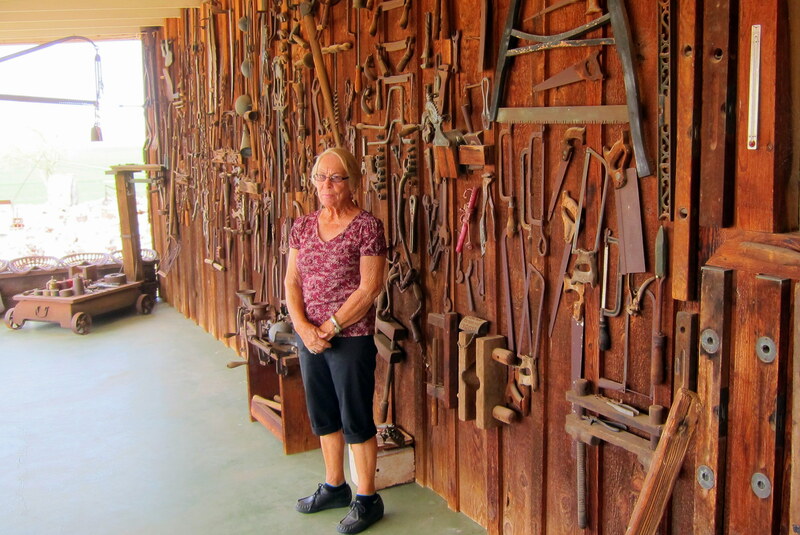 In addition to the items in her home, Windy keeps many more items in the various outbuildings scattered about her property. The yellow bus in the background of the following photo is actually an old bookmobile. Remember those? There are also lots of other automobile related antiques including old hand gas pumps. 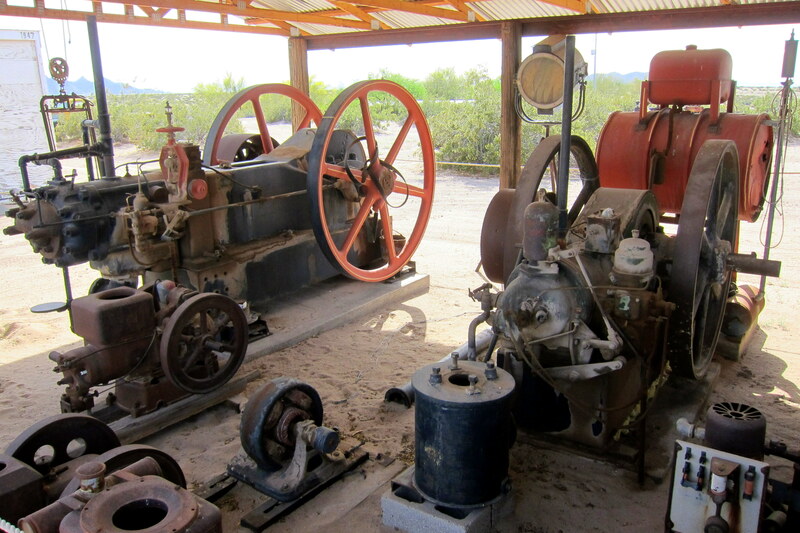 And a shed full of old belt driven machinery. And old scooters and engines. Many of which still run! 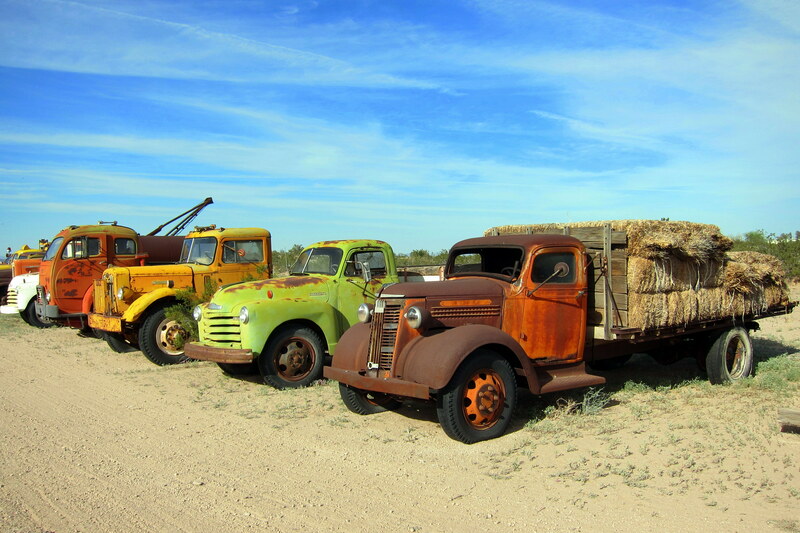 There are a few old cars and trucks. 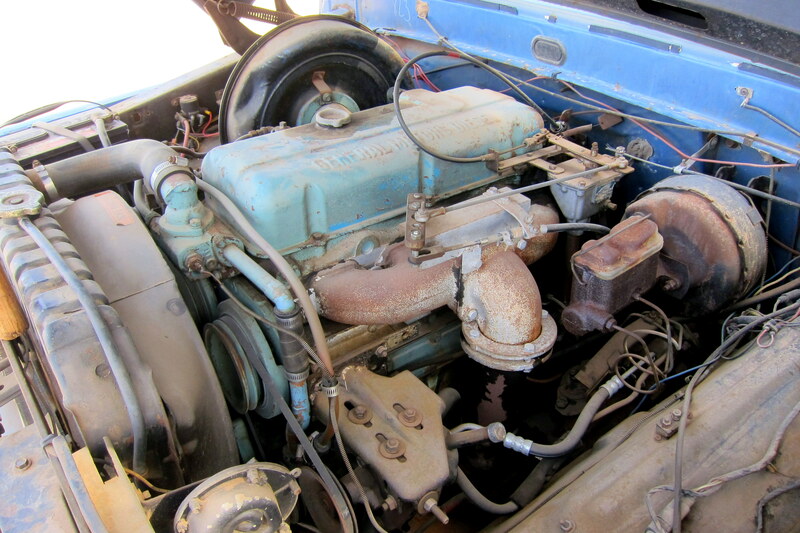 This runs as well and is used daily about the ranch! 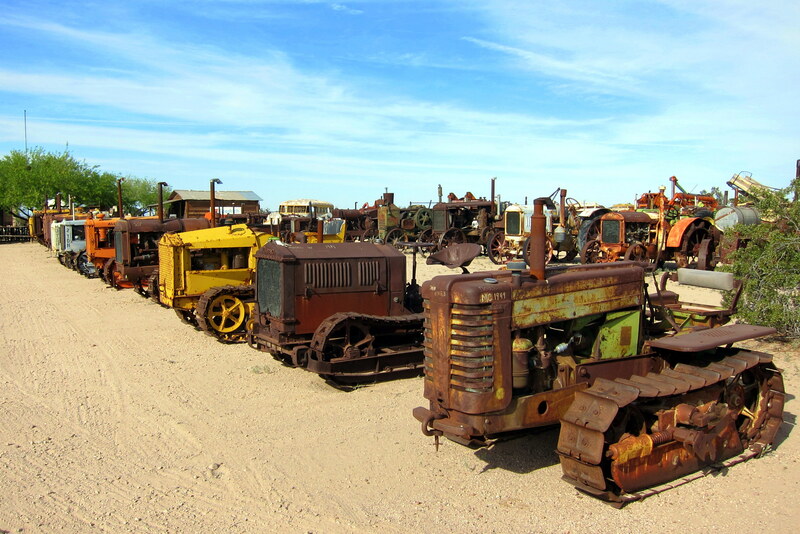 In addition, there are lots of old bulldozers. 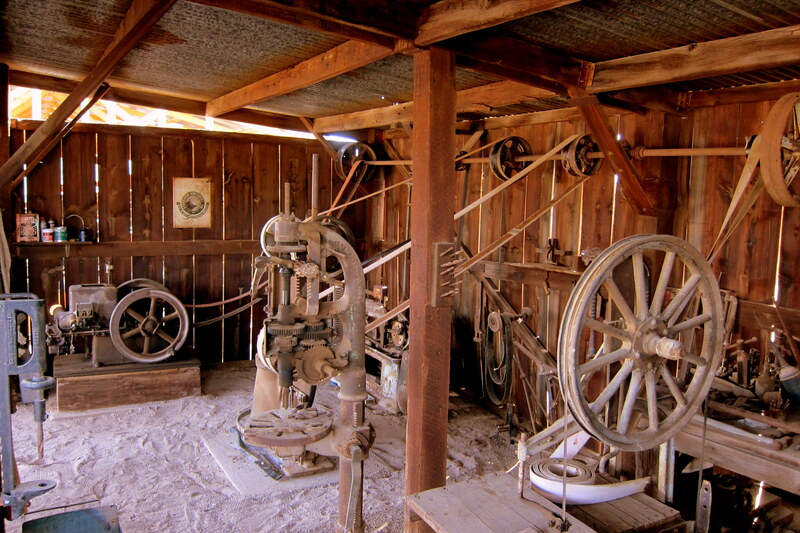 All the rolling machinery and stationary engines ran when brought to the ranch…..many still do! What doesn’t fit in the house or the many other buildings are lined up neatly on the ground to live out their years in the dry desert. 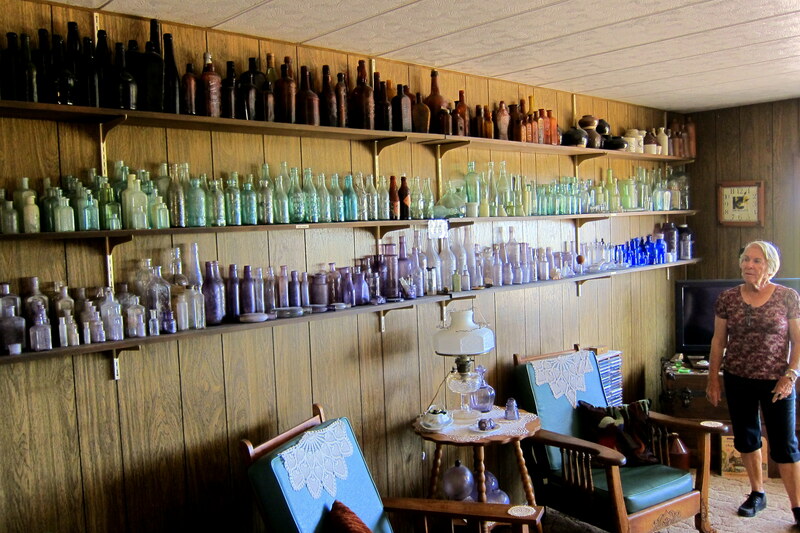 Even the hundreds of excess antique bottles! 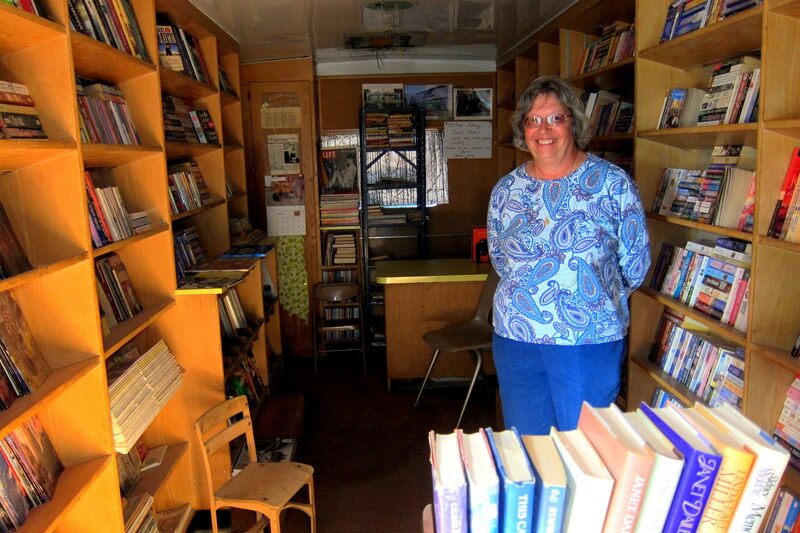 So, if you ever find yourself in Tacna, Arizona…..give Windy a call to see if she will show you around! Oh, in case you’re wondering, her name really is spelled “Windy”…..its short for Winifred. Returning to Yuma, we stopped in at Logan’s Roadhouse for an excellent steak dinner before returning to the campground for the night. Wednesday, March 19, 2014: Up early and began the process of breaking camp. As we were hooking up truck to trailer, Gloria walked over and invited us to a breakfast of pumpkin pancakes and real Maine maple syrup, so obviously we delayed our departure…..and we are certainly glad we did. The meal and the company were excellent! At 1115 Kit and I were on the road under sunny skies and a temperature of 86 degrees. As we made our way back to I-8 we noticed a number of farm fields amongst the RV parks that planted in Durum Winter Wheat. Well, that’s what the locals called what looked like long grass to us. Apparently it is used extensively in bread making. As we were leaving town on US-95, Kit noticed an RV dealer and she reminded me that our travel distance today was to be relatively short and we had plenty of time to stop for a look. Turns out, the dealer was the southern outlet to the one we stopped at up in Riverside a few months ago. Pulling into The RV Peddler, which is an Arctic Fox dealer, with our road weary Arctic Fox created a bit of a stir. The salesman that was the quickest was the one who greeted us and showed us around the inventory. There were some really nice units that we drooled over and might consider for our next purchase. The salesman was very patient with us, even after we told him that we were still in the looking stage. It is amazing the changes in RV technology in the six short years we have owned ours! 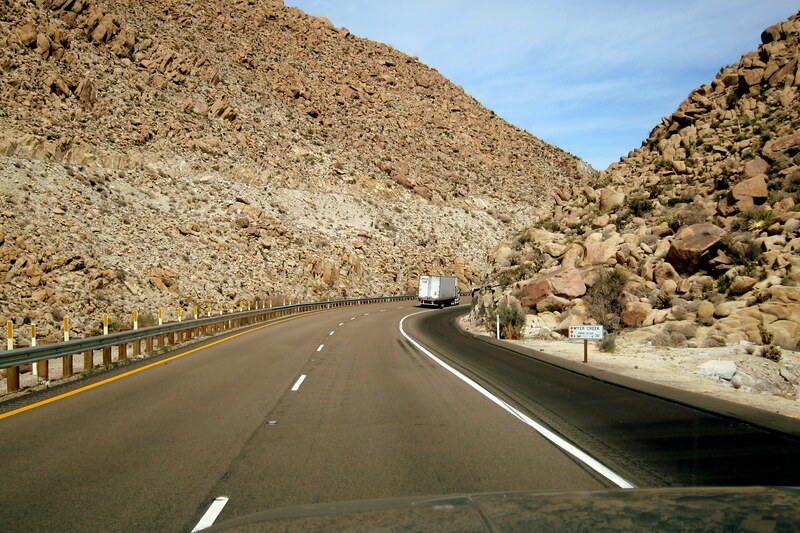 After a few hours of looking around we were on the road once again making our way up US-95 toward the Yuma Proving Ground and our stop for the evening. 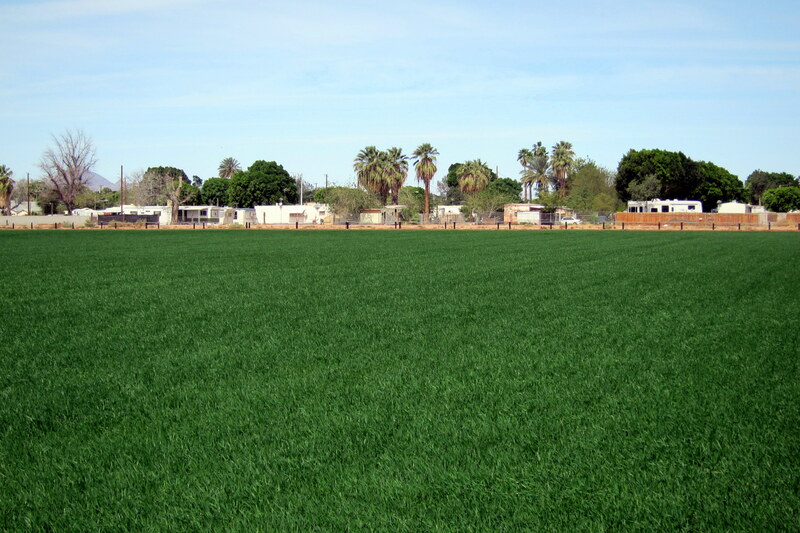 The Yuma area, consisting of fertile ground irrigated by the Colorado River features many farms and orchards. 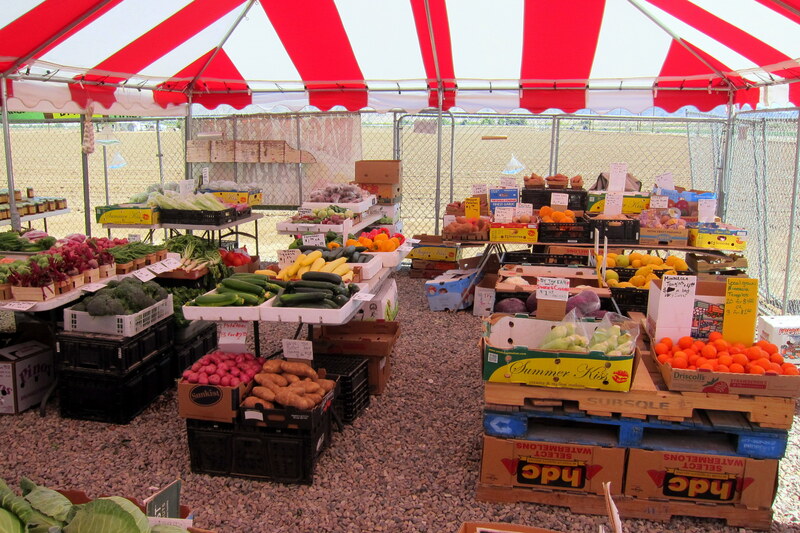 And as can be expected, there are also a number of roadside fresh fruit stand which lured us in for a peek. We went a bit crazy with all the farm fresh fruits and vegetables picked very recently from the local farms. Two bulging sacks and twenty dollars later we had enough to tide us over for many days to come. 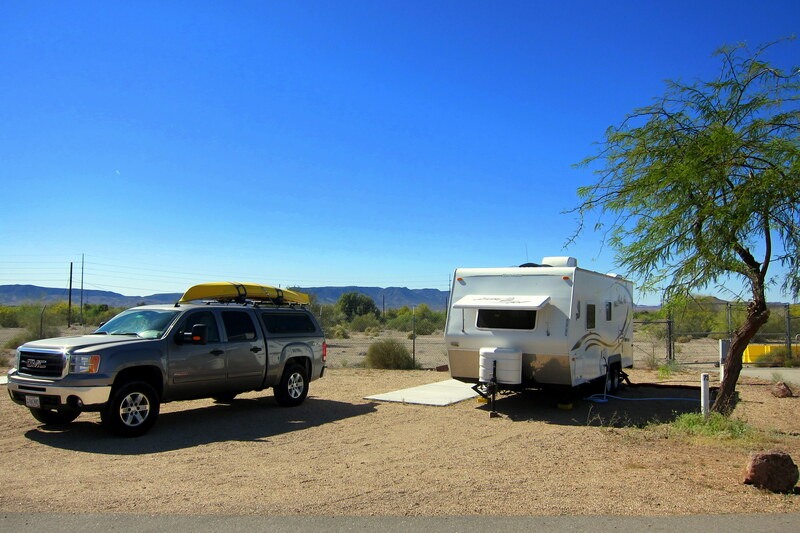 At 1500 we pulled into the US Army’s Yuma Proving Ground and found our way to their full hook-up campground. Just as we were setting up camp, our friends John and Karen happened by and welcomed us to the neighborhood. 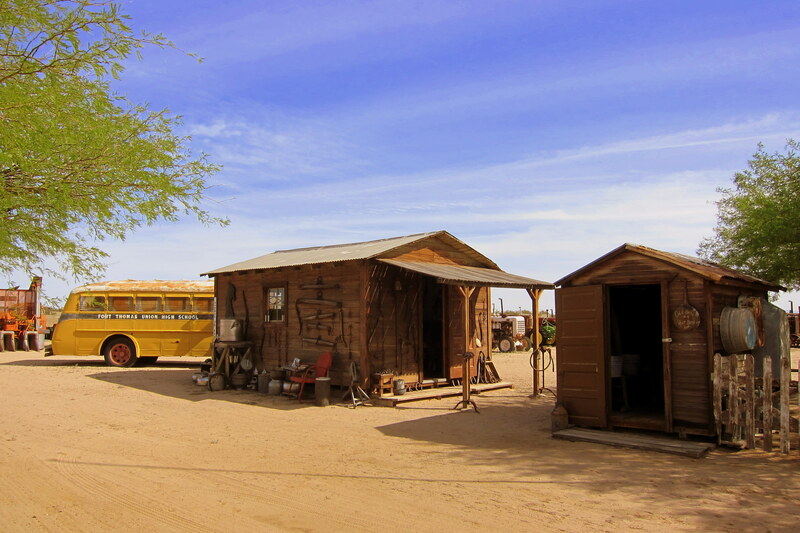 They spend their winter camped at the Long Term Visitors Area (LTVA) on the Bureau of Land Management (BLM) area. This dispersed camping opportunity is available to anyone who applies for a $180.00 permit which allows for up to 6 months of camping on any authorized BLM land. That’s a dollar a day folks, if I did my math correctly. The caveat is that this camping is on raw, open desert…..no hookups of any kind. There is a source for fresh water and a dump station nearby, but that’s it! John and Karen spend the summer in Bend, Oregon except for part of last summer when they used their truck camper to explore New England and spent a few days visiting us in Maine. To reciprocate, they invited us out to the LTVA tomorrow for a visit and to explore some of their desert backyard, an opportunity we are looking forward to. 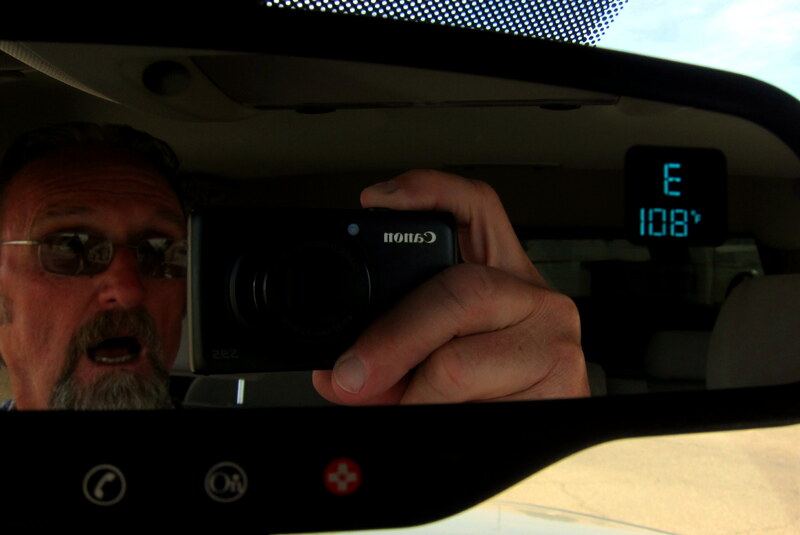 Thursday, March 20th, 2014-Yuma Proving Ground, Arizona: Woke early to warming temperatures and a gentle dry breeze. After breakfast we made our way to the LTVA to meet up with John and Karen. 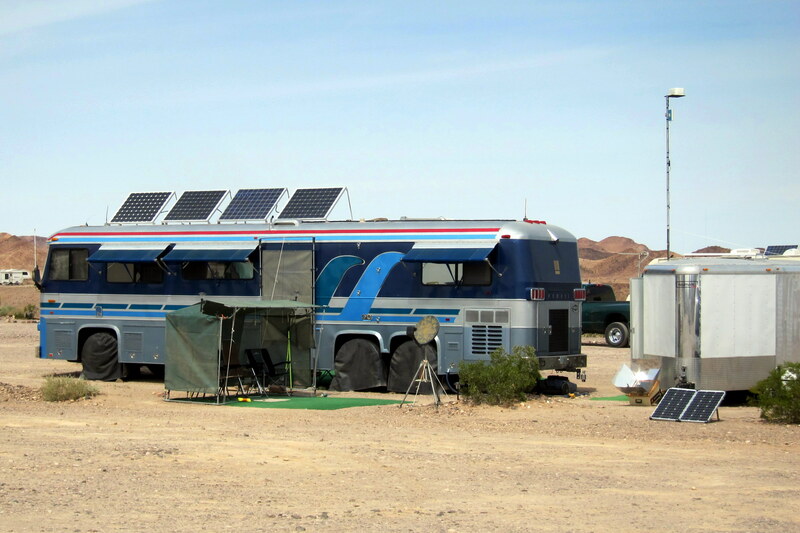 Their winter home is an Arctic Fox fifth wheel trailer and it has all the accessories that make living off the grid in the desert possible……not the least of which are roof mounted solar panels. In addition they have a generator and a wood pellet fueled barbeque grill! Living in this dry and somewhat desolate region takes a bit of guts and a lot of character. However it also takes a community of like-minded folks to help each other out during times of trouble or during an emergency. John loaded us all in his brand new Silverado 2500 Diesel and headed out into the tulles. 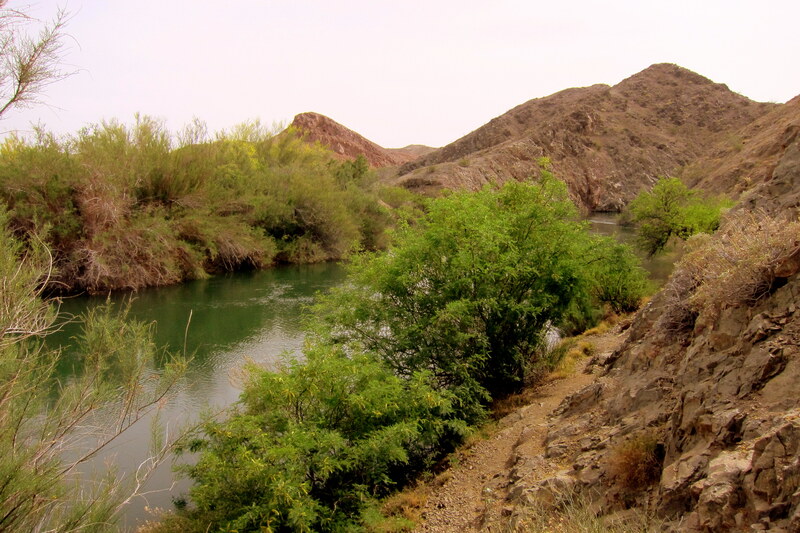 Even though this area is in the middle of the Sonoran Desert, there are many areas that feature lush growth due to springs or small streams, known as Riparian areas. And a few streams have been damned to allow for irrigation and to create wildlife habitat’s. A really nice day spent with some good friends ended with a fantastic meal at a local Mexican restaurant called Mi Rancho. Kit ordered a beef and bean burritos and I enjoyed The Trio Plate consisting of a Carne Asada Taco, a Carnitas Taco and a large Tamale. We all consumed a few bowls of freshly made tortilla chips and plenty of homemade salsa. 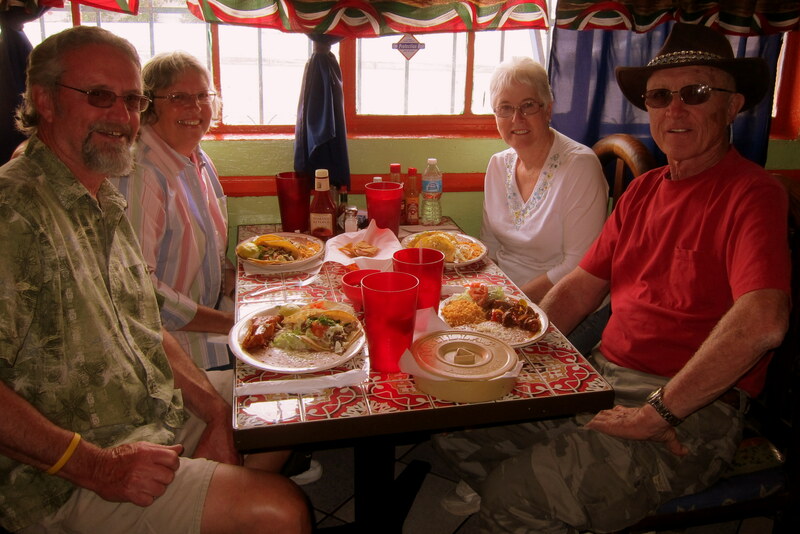 Everything was excellent…..you just can’t beat authentic Mexican fare made the traditional way by folks that were raised on the cuisine! 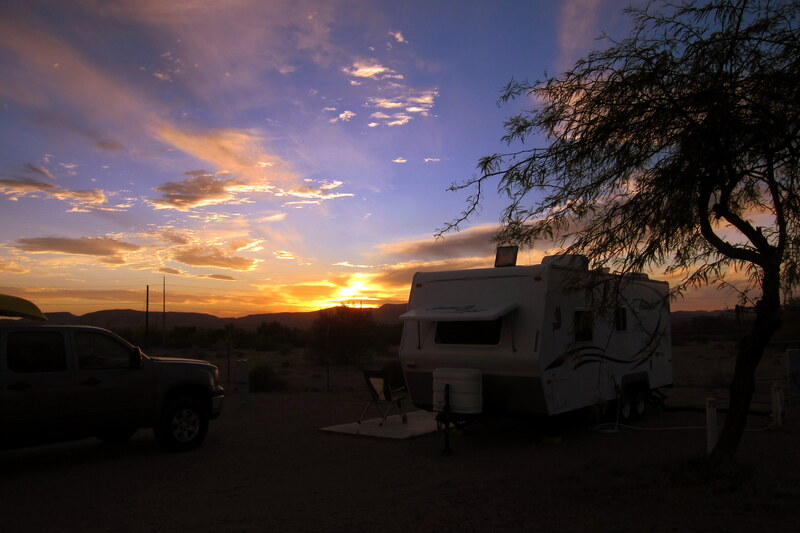 After a thoroughly enjoyable day, Kit and I relaxed back at the campsite as the sun set over the desert. 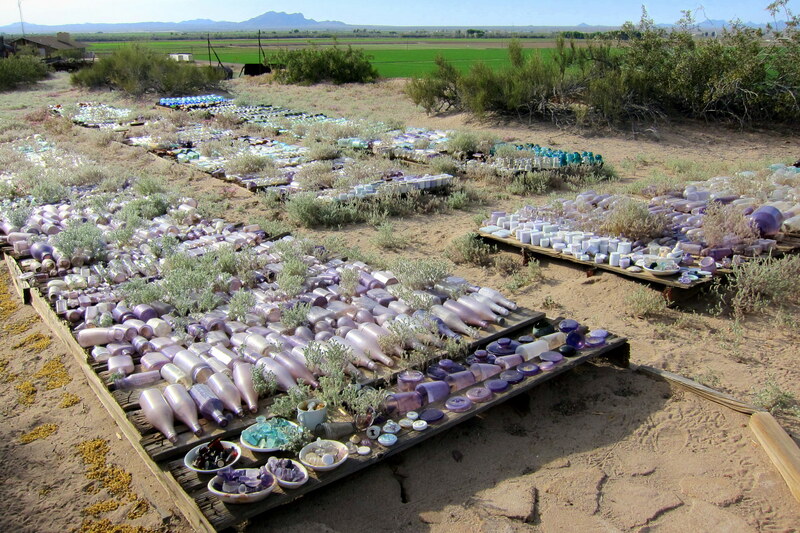 Tomorrow we head toward Phoenix for a few days R&R before returning to Tucson and some exciting doings…..stay tuned! 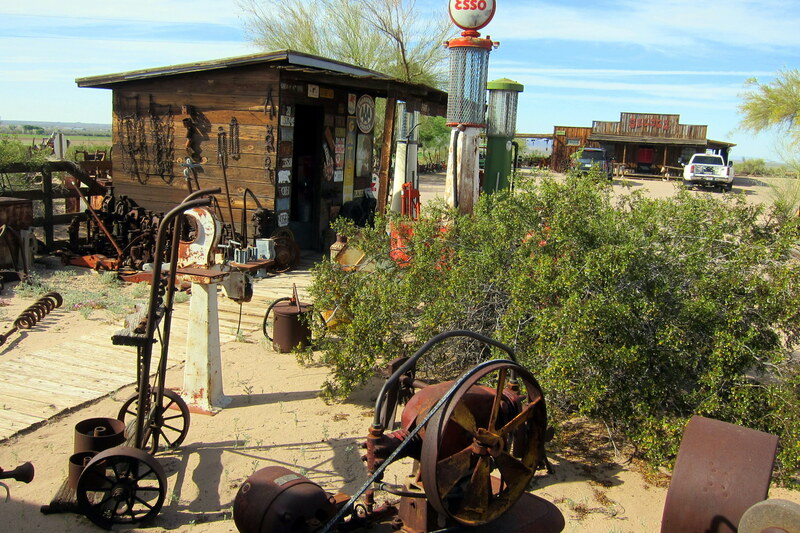 Kit’s Bits: It was so nice to finally stop and spend some time in Yuma! We’ve been through there many times over the last 48 years and never once have we stopped, other than to gas up the vehicle. We thoroughly enjoyed our visit with John and Gloria. We know them through Square Dancing in Maine and had never had enough time to get to know them better. They are a delightful couple enjoying their winters in Yuma and have settled into a nice routine in the area with many friends. 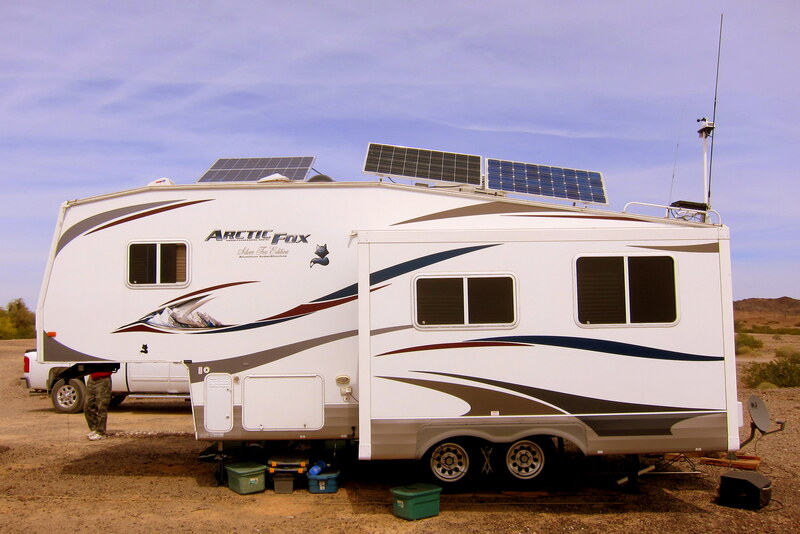 We call John & Karen our “online” friends; they contacted us via the internet while doing research on Arctic Fox trailers! Our “online” friendship spanned a couple of years before we finally met them last year when they came to ME! It was fun to visit with them again and learn how they spend their winters on BLM land, and deal with the many issues we all face while camping, but, in a different way. They have a lovely spot out in the middle of nowhere, and have a circle of friends in the area with which to socialize. People are so inventive on how to spend their retirement years! I love Windy’s collection! Incredible! Safe travels as you head home! Hi Folks: We much enjoyed the “tour” of San Diego..much different than when we lived there 1958-1960. John Roger was stationed at NAS Ream Field, Imperial Beach at that time. What a fantastic museum Windy has!! 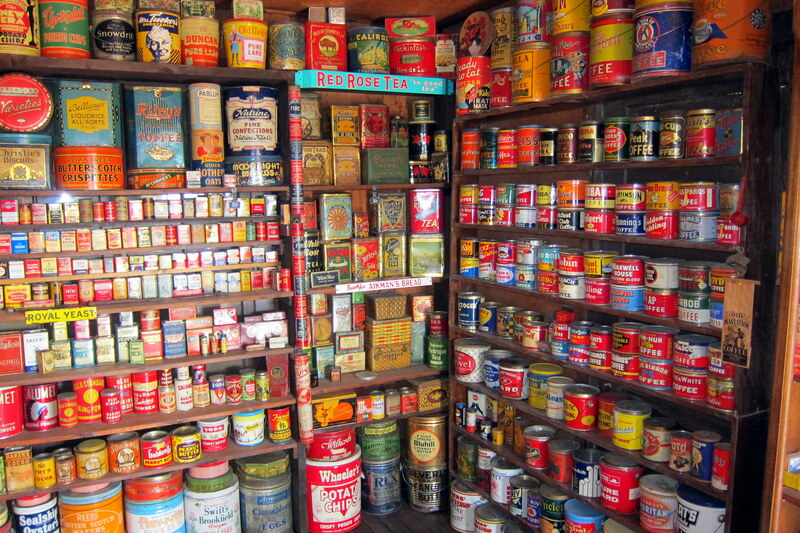 All of the old canned foods really fascinated me, and everything else is very interesting, too (much better than a computer museum!!!!). And I did notice that your “rig” is headed east. Can’t wait for the pictures of the “exciting doings” in Tucson! I CHEATED AND LOOKED BACK AT AN EARLIER PIC, YOU’RE HEADED EAST. CLEVER!! HAPPY EASTER, WE HAD WINDY AND NAN HERE FOR DINNER AND A PARTY FOR JEANNE’S B DAY. SORRY YOU COULDN’T HAVE BEEN HERE.